Ok, maybe I didn’t have a ton of coins, but the amount of coins I had is nothing to sneeze at either. A few years back, I noticed that I’d have pocket change lying around after every transaction. I’d stick it back in my pocket, but those two dimes, a nickel and a penny don’t help much if your next cash payment is $12.79. Plus, who wants to stand in line figuring out where each and every coin is needed to complete the transaction? Much better to simply pay in dollar bills and save the change for later, I figured. Perhaps I could even buy something nice with the saved up money. Since I didn’t want it stashed in a thousand spots around the house, I took an empty spice container (one of the big ones you can get from BJs) and started plunking my change in there at the end of the day. 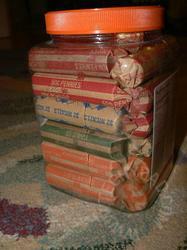 Over the years, the container filled more and more. Last year, the coin jar got to be too heavy so I figured it was time to roll the coins up. So began a project with NHL. He enjoyed helping me count the coins and roll them up. I stuck the rolled up coins in another empty container and made a mental note to deposit the money. Somewhere along the way, though, my mental note came loose and sliped under the mental refrigerator. Recently, I decided to finally deposit the money. 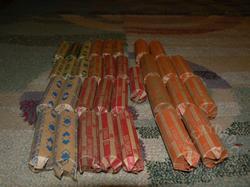 First, I rolled up the new coins that I had collected. After counting it all, I stuffed the rolled coins back into the container. Of course, lifting it was a challenge. It weighed 12 pounds. (Yes, I weighed it. I’m that much of a nerd!) Have you ever tried to life 12 pounds of coins? It was HEAVY! I toyed with keeping it around for weightlifting but figured a set of dumbbells would cost a lot less than the amount of money in that container. So how much money is 12 pounds of coins? Well, in my case it totaled $144.50! Not bad for a few years of tossing coins into a jar!